Some brides decide they don’t want to go the traditional route, and instead decide to show off their style and uniqueness to go against the norm. You will never believe what these brides wore to their own weddings. While some made it work, others might have some regrets when they are looking through their wedding albums in a few years. From camouflage to star spangled banner styled dresses, these brides are most definitely one of a kind. A bride’s wedding dress is the focal point of the wedding prep, its what some women have dreamt about ever since they were little girls. Fairytales and Disney princesses definitely played their role in guiding little girls to believe that they need to dress up like fairy princesses on their wedding day. That is most likely why Evka, aged only 19 years old, decked out in a dress containing 19k carrot gold. Don’t worry, this little number only costed Evka a mere 250,000 dollars. The words “I do” have officially been reinvented. This bride said “baahhh” instead, wearing sheep fur that she borrowed from her furry friend. They even walked down the isle together! Small towns and farm life definitely have their own spin on weddings, but this bride and sheep duo took it to a whole new level. 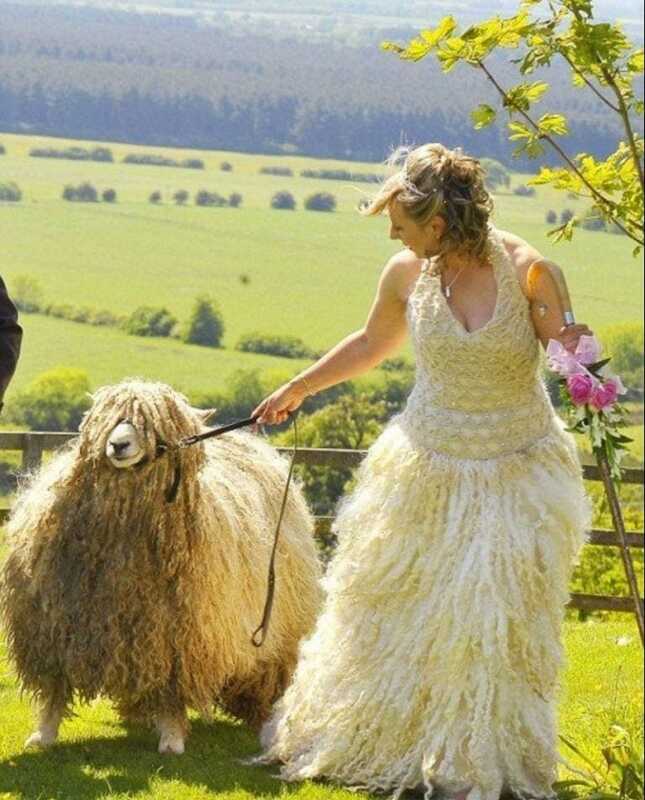 Don’t worry though, her sheep was not harmed in the making of her wedding dress. Don’t forget to check out the bride’s sheep herding staff in her other hand, we think it completes the look. If you’re wondering why this bride’s grip on her groom is especially strong, it’s because she’s actually afraid of being blown away! 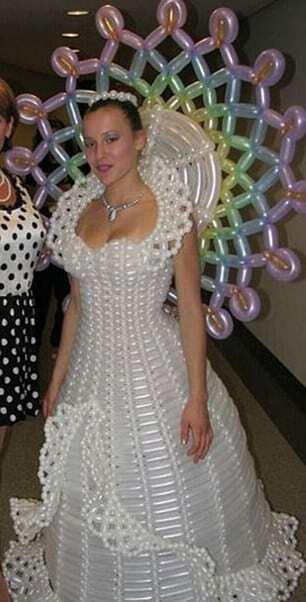 Her balloon dress is one of a kind, made with no material whatsoever other than air and rubber. Careful there sweetheart, we wouldn’t want you to sit, dance or really do anything other than stand still on your wedding dress. Otherwise the guests might get a little bit more of a view than they bargained for. This peacock, I mean bride, asked her designer to make her a wedding dress inspired by the Rio carnival. Please note the extra three feet of feathers and golden designs delicately framing her, completed with a crown and scepter. Don’t expect this bride to dance the night away, that crown doesn’t really allow for much movement aside from the pose she is making in this picture. I guess the dress of your dreams comes at a price. Sorry sweetheart, theres no room in the limousine for you. 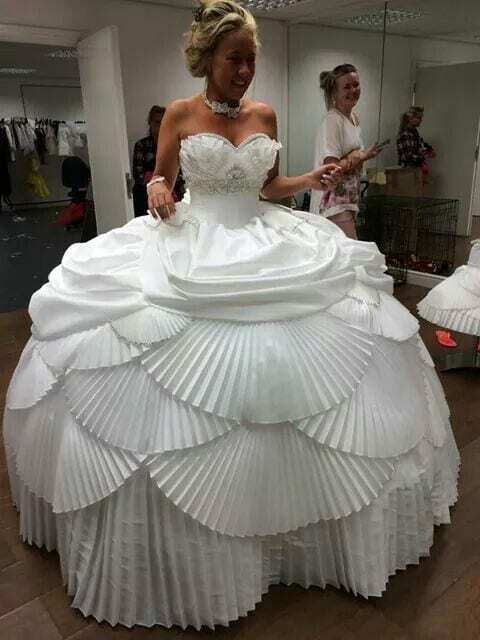 This down to earth bride only wanted a mere 50 feet of frills attached to her dress. 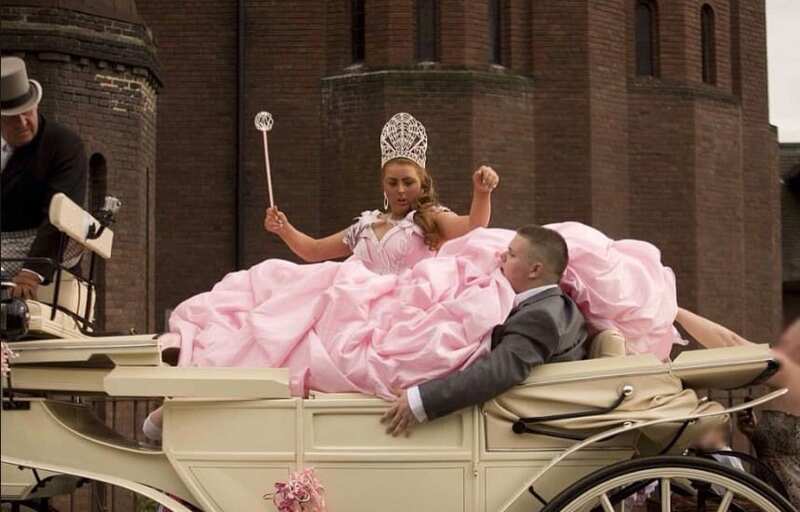 While the bride was busy emulating a Disney princess, we hope that her poor groom isn’t stuck somewhere under those frills in the back seat with her. But this bride didn’t stop at the frills, oh no, she needed a matching over the top tiara and earnings in case the guests might get confused and think she wasn’t the bride. This real life fairy is actually a bride, and her prince charming draped in a cape is her groom. It seems that they take role playing to a whole new level as they reenact some sort of fairytale moment. Her wings are no accident, we think they are a secret backup escape plan. In case the groom is not so prince charming she might just use her wings and fly away. He better be on his best behavior. Michelle basically coined the D.I.Y trend. This art student decided to use her own bridal gown as her final school project. And we think she aced it. For the amount of coverage she got for this awesome and unique wedding dress, we hope her art school teacher agrees. Sometimes traditional white just isn’t right. Michelle graffitied her and her groom’s initials onto her dress, ‘H’ for Harry and ‘M’ for Michelle. I hope the store H&M doesn’t mind. If how you dress is supposed to be a window into your soul, then this bride is definitely someone that is vibrant and happy. This rainbow colored dress, complete with rhinestones and all the frills tell us that this bride has a colorful personality to say the least. Don’t knock it until you try it, this bride seems to be glowing with happiness and I don’t think it’s because of her groom. I am confused though why she didn’t get matching rainbow colored braces. This bride and groom duo are matching in a way that we have never seen before. His green trucker hat matches her green bridal gown which all come together to match the green background. It’s almost as if they don’t want to be seen. 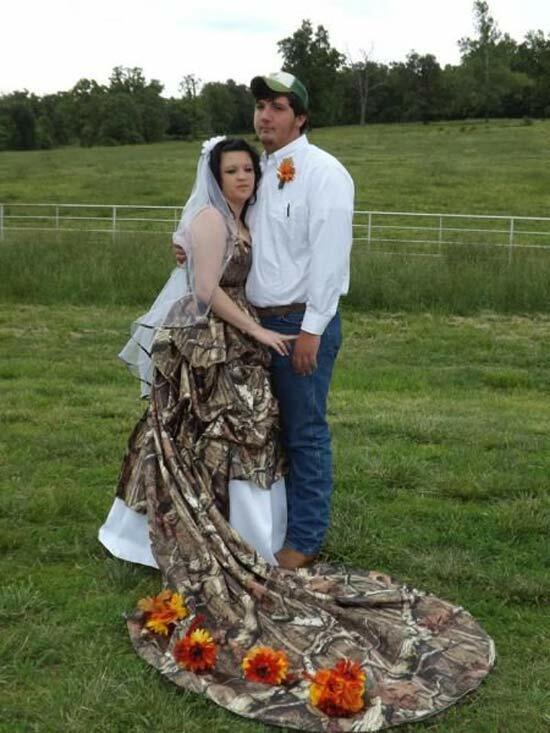 This couple went to their wedding in camouflage and we are not sure why. Maybe they don’t like being the centre of attention and want to be able to blend into the background if they get overwhelmed by the guests. Most brides can’t seem to wrap their heads around the idea that a wedding dress is only supposed to be worn once. 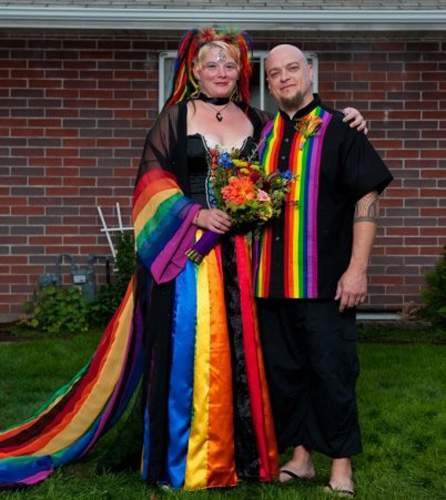 This couple however embraced that theme and even went to the extreme. 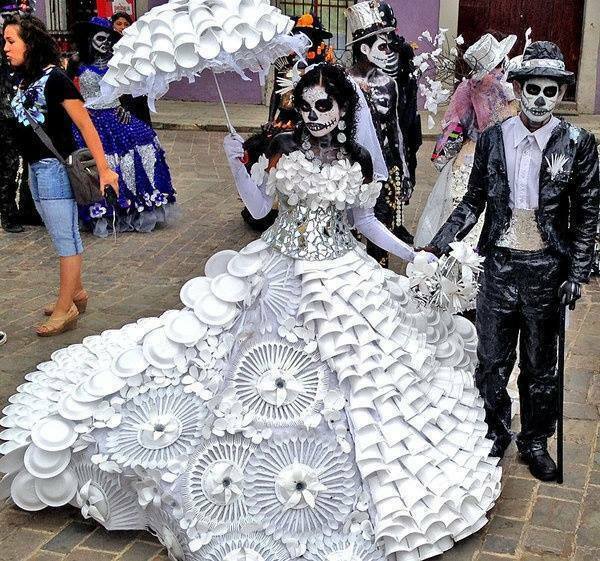 Her wedding gown is made out of white plastic cups, plates, spoons, you name it. While her groom is rocking a suit made out of garbage bags. This green wedding was embellished with full face painted masks. We wish them a happily ever after and hope they continue with their recycling and earth conscious decisions. 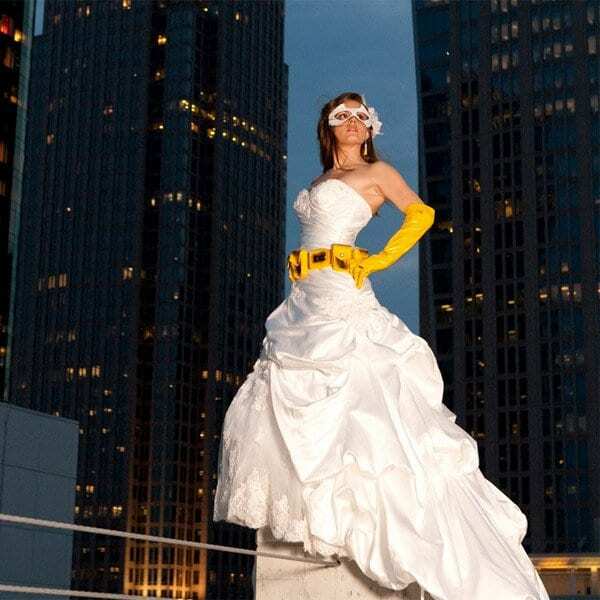 We are not sure if this bride is emulating Katniss Everdeen from the Hunger Games. 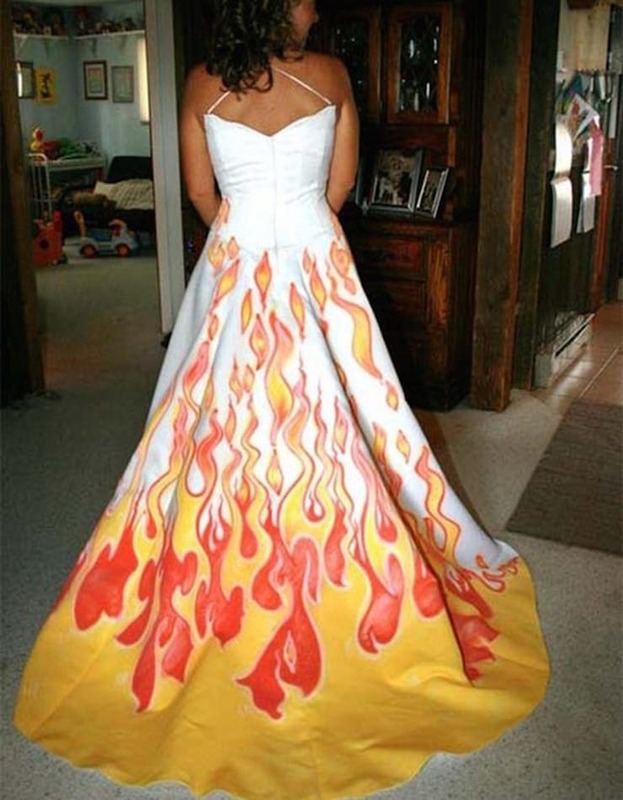 But regardless, this bride is on fire! I doubt the wedding hall took place in a church because these flames resemble the flames of hell. Either that or she is a pyromaniac. At least she left the top half of her dress traditional, that way in ten years she can crop the bottom half out if she gets remorseful of her decision. Guests were scared to lose the shirts off their back at this pirate themed wedding. This bride below went with a traditional pirate’s maiden costume, complete with a tilted hat, killer boots, a corset and of course, a garter. Her pirate groom could give Jack Sparrow a run for his money. He is sitting on his thrown with a sword clearly shown, scaring off any men who would dare to say “I object” at their wedding ceremony. This blue night’s sky themed wedding dress was adorned with crystals, Swarovski we can only assume, to emulate a starry night. She was pictured in front of the more ‘conservative’ and ‘traditional’ white wedding dresses so that she could truly pop against the background. 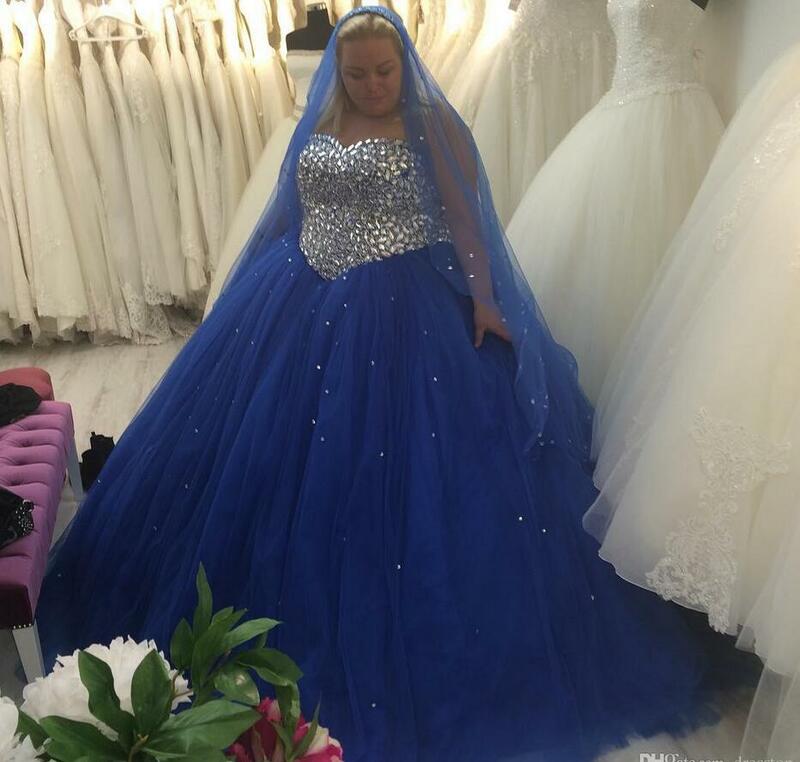 The famous saying “Something borrowed and something blue” was heavily taken into account when designing this dress. We hope the blue dress doesn’t actually reflect her mood, because she isn’t exactly smiling here. Which side are you here for? This outfit is truly one of a kind. 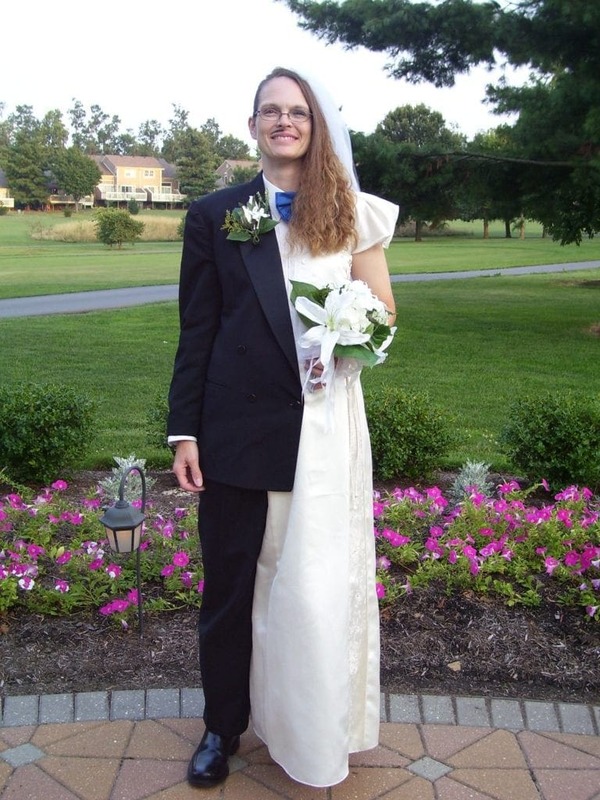 This person wanted to show both the identity of a groom and a bride all in one. The left side of this person is dressed up in a suit complete with a half of a mustache, a bowtie and a boutonniere. While the right side is covered in a classic white wedding dress, veil and long hair. This person has really brought the saying of “when two souls become one” to a whole new level. 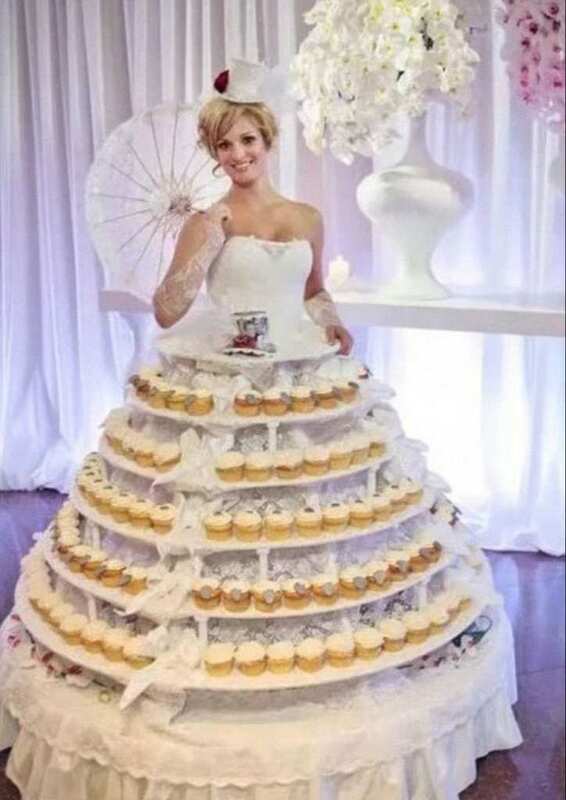 This woman excelled in the art of self control by actually wearing her wedding cake. God knows that if I wore that dress, it would be eaten before the reception. 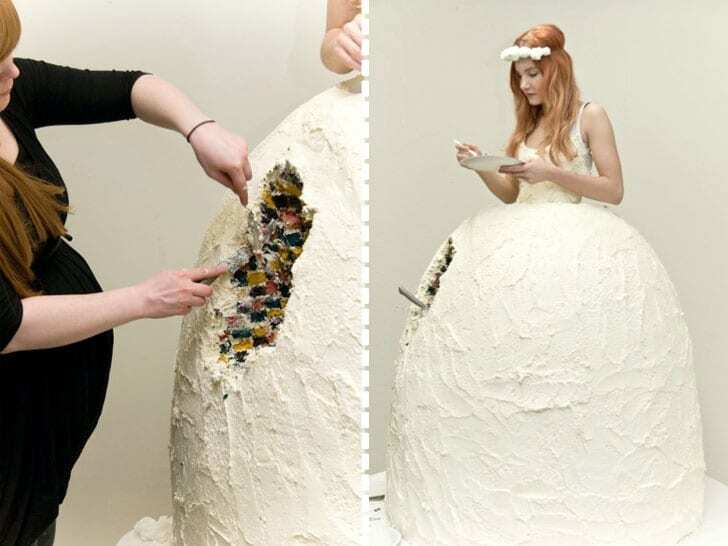 This bride decided to take the idea of an expensive and time consuming wedding dress in a different direction by wearing an edible cake.This way if her guests get munchie during dancing or if the officiator wants a snack during the ceremony, a tasty bite is never far away. The groom in the picture below seems to be second guessing his decision as he gets crushed by his bride’s over the top fluffy pink gown. This bride is adorning a foot tall diamond tiara and a bedazzled scepter. Why wear the traditional white when you can wear pink? The horse draw carriage completes the princess theme perfectly. She seems to be pleased with her choice of outfit and theme, we just hope the groom is too. This unique couple seems to have embraced their individuality. Who needs the classic black tux and white bridal gown when you can let your inner self shine on your wedding day. These two seem to be colorfully in love and showing a rainbow of emotions. They match perfectly, rainbow hair and all. The groom’s flip flops depict how down to earth they are. The hippie vibes are working, especially with the tattoos and face paint to top it off. 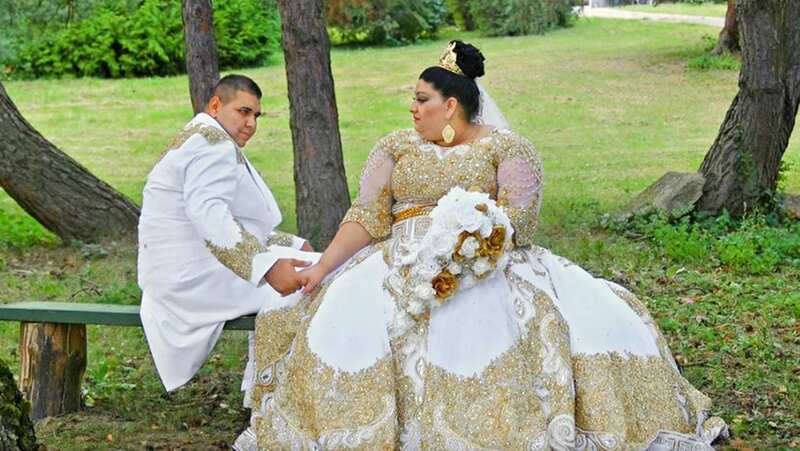 This selfless bride was thinking only of her guests’ hungry stomachs when she designed her dress. It’s Marry Poppins themed and her guests are very grateful. No guest will go home hungry because this bride personally has them covered. Every type of cupcake imaginable has been ordained onto this chipper bride. And why wouldn’t she be happy? She is well fed and about to marry the man of her dreams decked out in white and her favorite food. The longest train award goes to this bride. 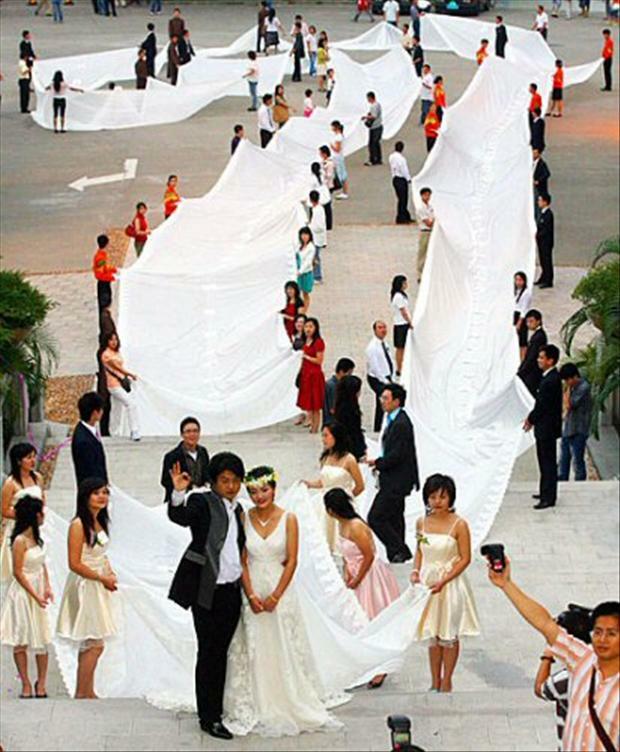 She seems to have about fifty of her poor guests holding up the train of her wedding dress so it doesn’t get dirty. We are not sure how she is going to dance with that train, but hey if it makes her happy who are we to judge. Although, for her sake I do hope that that train is actually removable. Otherwise, if she decides to make a run for it, she wont get very far! This bride took the conventional football ‘Beer Hat’ to a whole new level with her wedding dress. She couldn’t have her guests chasing waiters or waste any time by walking to the bar, so she turned her dress into the bar. 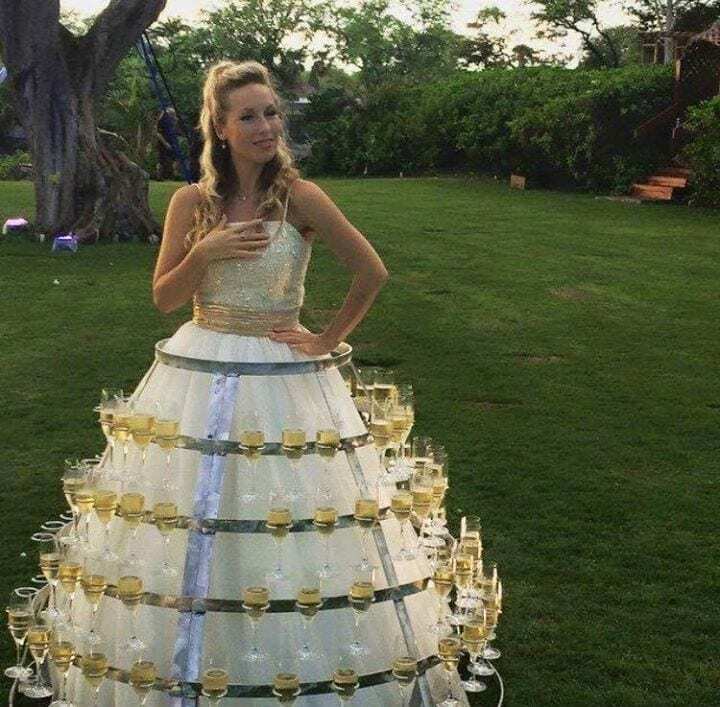 Her dress holds at lest seventy two cups of champagne at a time. No guests will ever have to clink their glasses or say ‘Cheers’ because this bride’s dress actually does it for them. “Red, white and blue” is the new “Something borrowed and something blue.” This bride decided to wear the American flag to her wedding, showing that she is more patriotic than the first lady herself. Her starry chest and red and white pinstriped dress was no accident. It was a testament to her devout commitment and love of the United States of America. And I think she deserves a personal congratulations and well wishes from the president himself. Orange you glad you dressed up like that? Is it fall themed or orange prison jumpsuit themed we’re not sure. But this couple is definitely doing something different. The grooms backwards hat and his finger sensually touching his lips is making a statement, were just not sure what it’s exactly saying. 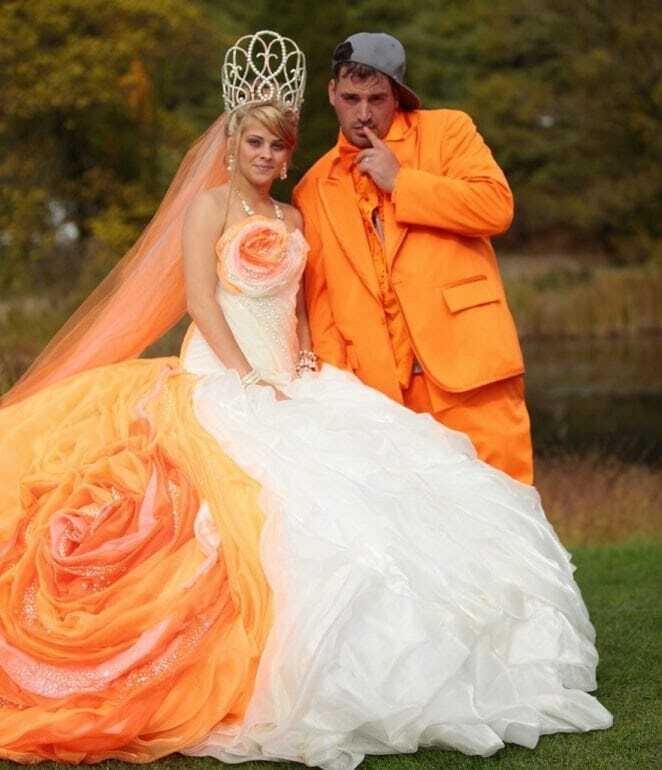 The bride is matching her grooms all orange getup with a multi toned orange dress and of course a massive tiara. They never forget the over the top tiara. We hope this couple lives happily ever after with no regrets. Who needs to use your ams when you have a cacti themed wedding dress. This couple is beaming at each other, full of love, happiness and flower power. This bride looks like all she needs in life is her groom by her side, similarly to a cactus that needs only water and sunlight to survive. This couple dressed in pink and flowers on their wedding day are showing the world that they love both each other and plants, and the two can be combined. Hello Kitty just got married and she is beaming. This bride is all about the Hello Kitty and was not about to leave it behind on the biggest day of her life. Hello Kitty Balloons, colors and even a sticker on her dress in case you missed the idea. 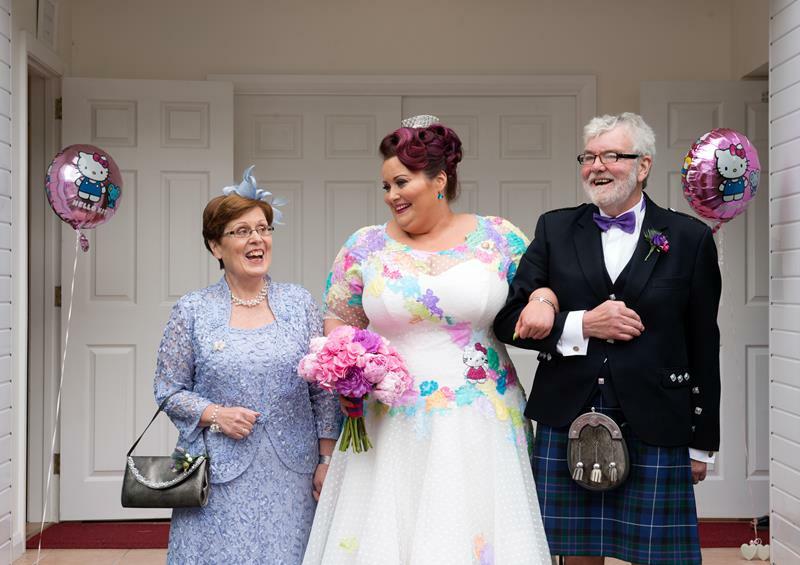 The father of the Hello Kitty obsessed bride didn’t want to be overshadowed on his big day so he busted out the Scottish kilt, but at least he managed to dress it up with a suit jacket and bowtie. 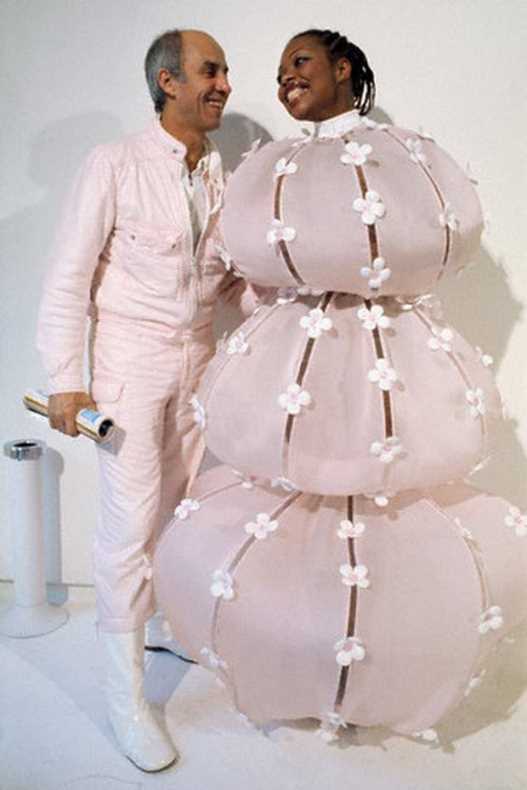 The sweetest bride I ever saw is obviously the one that is covered in candy gum drops. This bride’s child like soul is portrayed through her wedding dress, showing her love of everything colorful and candy like. She kept it playful and a bit more R rated with a sequenced matching bra. This Barbie doll of a bride wanted to keep things interesting, letting her playful side shine. Her matching purse is also covered in gum balls in case you were worried. A bride is supposed to be the centre of attention on her wedding day. This bride was smart enough to ensure that she would remain in the lime light, even when the lights go out. 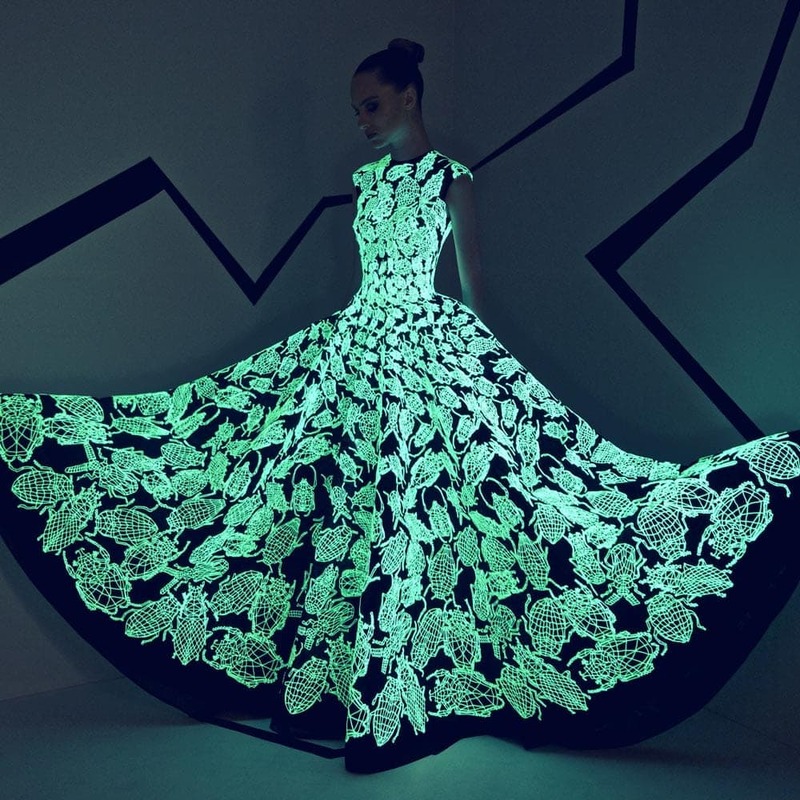 She made a glow in the dark wedding dress and she is definitely glowing. But this dress is no normal glow in the dark dress, no, this bride took a bit of a horror movie spin on it. There a beetles crawling all over her, I guess you can say its one of a kind. Ombre wedding dresses have been in for a while. But this bride wouldn’t dream of just stopping there. The red dress slowly turns lighter until it becomes a traditional white at the bottom of the dress. What’s the big deal you ask? This bride decided to make her dress out of hair. Yes, you read that correctly. Hair. 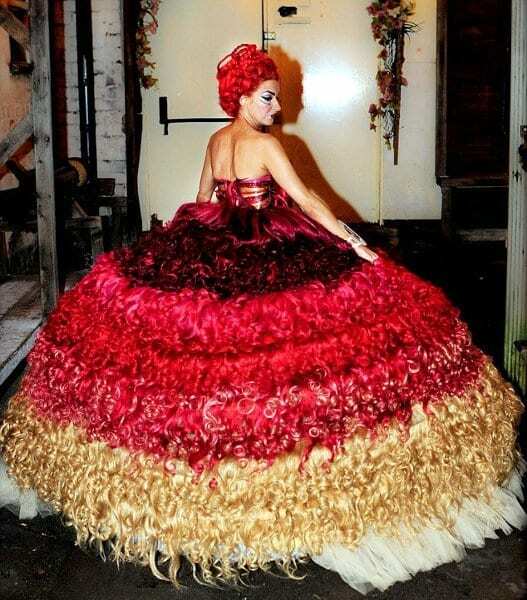 To top it off she died her own hair fire engine red and wore it up so it wouldn’t distract from the red in her dress. Who needs a superman groom when you can be a superwoman bride yourself? This bride gets married by day and saves the streets from criminals by night. She is a super hero that we all want to emulate. Her bright yellow tool kit helps her stave off unwanted hoodlums. And she never takes off those bright yellow gloves so she can stay clean. Her white elegant mask shields her identity from street thugs, she would never want her groom to be compromised. This woman has probably always been fascinated with balloon animals, ever since she was a child. 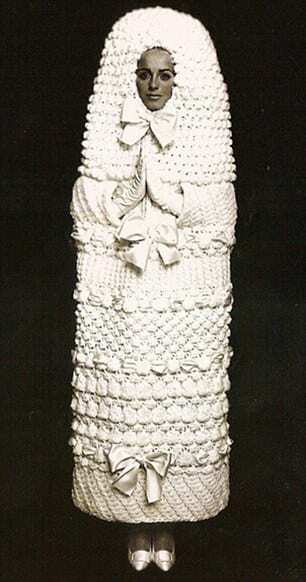 So, when her other half proposed, she knew there would only be one kind of wedding dress for her. 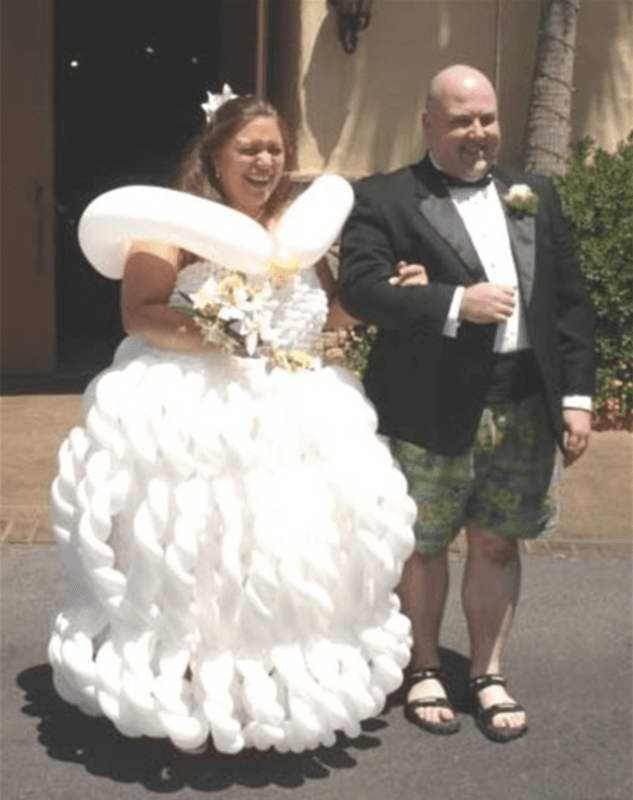 She tracked down her favorite childhood clown and asked him to use his balloon modeling skills to bring her dream dress to life. At least, we guess that’s what happened here. We particularly like the backpiece, which is looking pretty regal. That’s some serious skills! 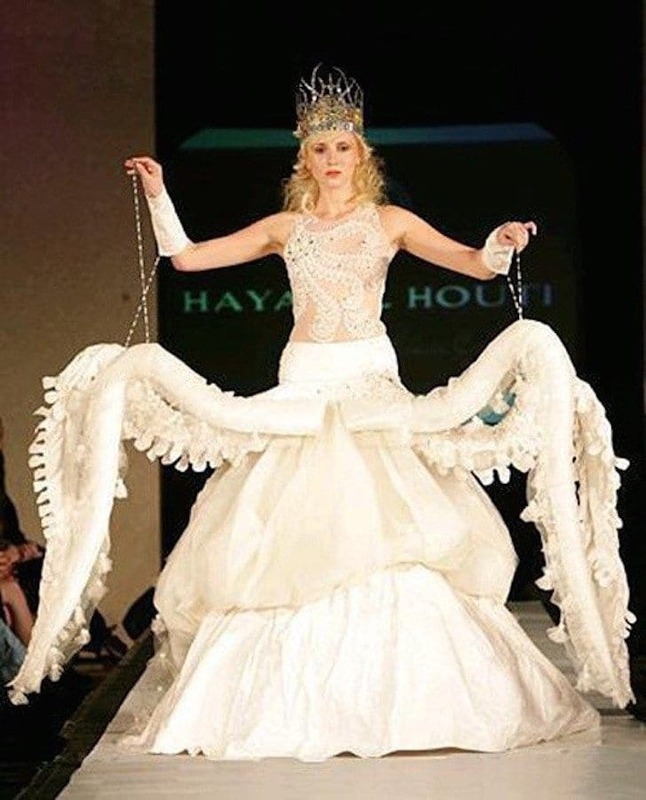 Not sure about you, but we have always loved the thought of having squid tentacles on our wedding day. You mean, you haven’t? 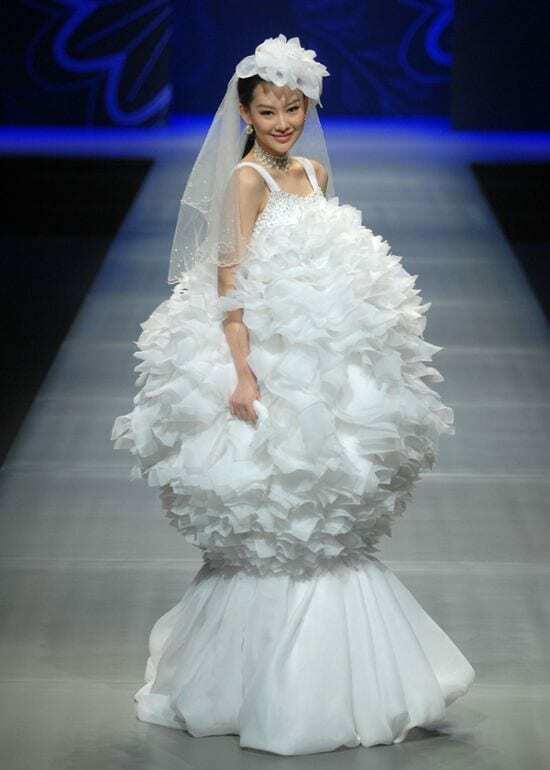 This wedding catwalk look is something that didn’t really catch on, and we can’t quite work out why. Perhaps it’s because whoever you are marrying would have to buy a whole host of rings – one for each tentacle. Yeah, that’s definitely the reason it hasn’t caught on… That and the fact that no bride really wants to look like a sea creature on their big day, do they? Look how happy this bride is that she’s marrying a dessert chef! It’s a dream come true. 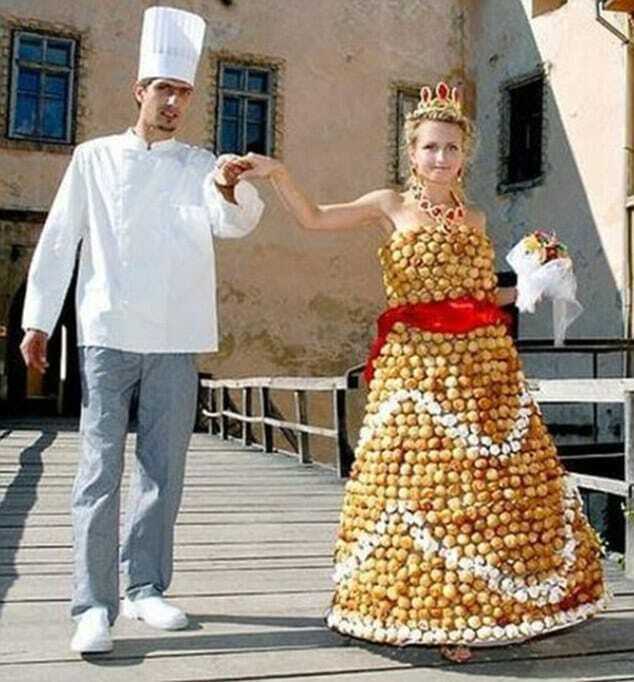 Someone who loves her, promises to care for her in sickness and in health, and who can make hundreds of profiteroles for the most epic wedding dress of all time. At the wedding reception, a whole load of people are going to cover her in chocolate sauce and cream. Who needs to pay for a wedding cake when dessert is on the bride?! Okay, we literally have no idea what to say about this one. It kind of looks a little bit like the thing our grandma used to put over the toilet paper in her bathroom. We have a feeling you would only be able to wear this ensemble at a winter wedding, as it looks a little bit too hot for a beach vibe. We like that she is keeping everything to the imagination though. Well, other than her face poking through and her ankles at the bottom. These two just love trash! They can’t get enough of it! They decided that as it was their big day, and they could wear what they wanted, they’d opt for trash bags, plastic, and toilet paper. We just love how the plastic and paper combination just flutters in the wind for their photos. It’s like she’s a bird, soaring in the desert… Covered in trash. Well, as long as they’re happy, that’s all that matters. Right? The bottom of this dress looks like one of those pretty parasols that you’d twirl around on a summer’s’ day. It’s also the perfect place to hide your husband, for when he gets cold feet. This dress is truly something else, but don’t just take it from else. Look in the background, and you’ll see someone else unable to hide how funny she thinks the whole thing is. She may be laughing now, but she should see her bridesmaids dress! We have seen wedding dresses in all shapes and sizes, but this one really stands out. Literally. We want to know what kind of body shape the designer thinks this will be flattering on. Is it to hide curves? Is it to make you seem curvier? Is it for women who have always dreamed of looking like a pom pom? We actually have no idea. At least she kind of looks happy about wearing it, though. These two have taken their love for each other and their favorite color to a whole new level. When picking a color scheme for the wedding, there was one clear choice for them both. Orange! He’s rocking the orange suit, she’s got some stunning shades in her dress, and it’s all finished off with a pretty epic looking crown. We’re not sure why the groom didn’t go for an orange baseball cap, but maybe he thought that was just one step too far? This woman wanted to replicate one of our favorite pastimes when it came to her big day. Bubble baths! Luckily, her dress managed to capture that look in all of its glory. Either that or she really is floating on cloud nine as she’s about to marry the person of her dreams. To be fair, we’re totally digging the bow and the open back on this dress. It is pretty dreamy! And bubbly. This bride loves her country – almost as much as she loves whoever she is about to marry. 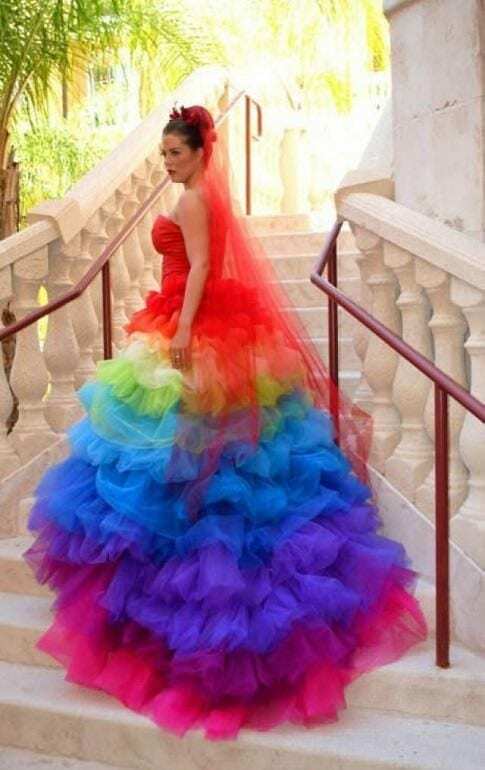 In fact, she wanted to combine her biggest loves on her wedding day and so opted for this as a dress. We’re not sure if it is actually a dress or simply a flag that has had some straps added to it. 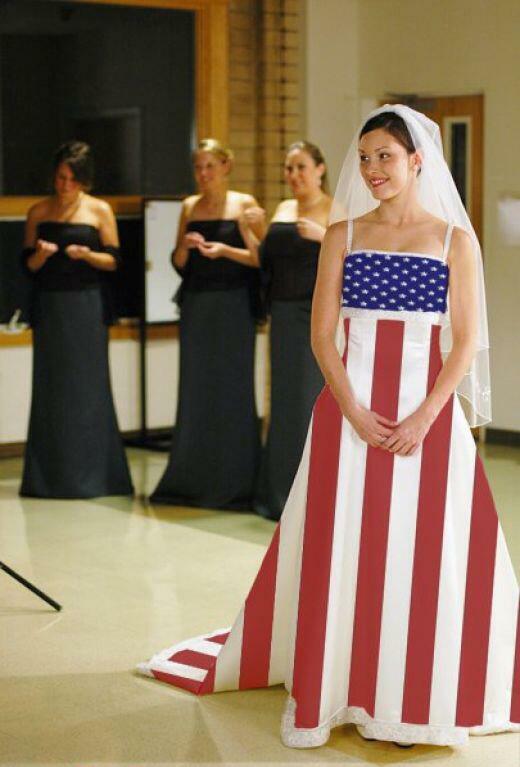 Her bridesmaids in the background look pretty drab compared to her red, white and blue ensemble. Although most brides like to go traditional with their wedding dress color, there are others who like to embrace their own personality and a few of their favorite things. We guess that his woman wanted to incorporate her favorite color into her wedding dress – but there was one problem. She couldn’t remember which one was her favorite! 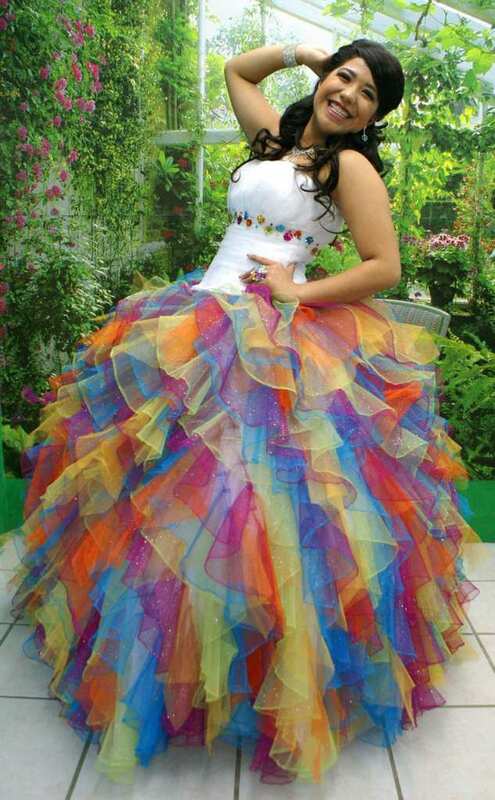 Just to be sure, she put all of the colors on one dress in the hope that one of them had to be right, bright and beautiful. If you’re excited about your wedding day, you might feel as though you’re ready to burst with excitement. You’re probably counting down the days until you can inflate at the sight of your bride or groom at the end of the aisle, and pop that bottle of champagne at the reception. Okay, that’s enough balloon jokes now, but we can’t help ourselves. 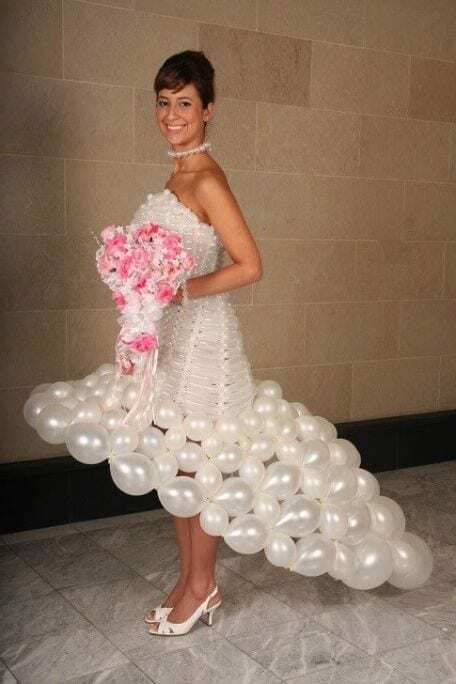 After all, there is a literal bride standing in front of us with a wedding dress made out of balloons. We can hear the squeak as she walks from here. The more we look at this dress, the more we don’t understand it. The dress itself is very grecian with its golden belt and its flowing qualities, and her hair looks as if it’s been modeled on Megara’s hair from the Disney animation, Hercules. Yet, this bride seems to be holding a Victorian style umbrella that just doesn’t seem to match. As if that isn’t bad enough, she tops the whole thing off with some snazzy cowboy boots. Anyone care to explain what’s going on here? Nowadays, the world is all about reducing, reusing and recycle to save our planet from mass extinction – because that wouldn’t be too great. If you’re staring at this photograph and wondering how you know this woman, you’ve probably seen her in your magazines! This is Lady Mary Charteris, the daughter of the 13th Earl of Wemyss and the 9th Earl of March – whatever the heck that means. As an it girl, model, and socialite, Mary is used to being in the spotlight, and her wedding day definitely brought the spotlight even closer to her. 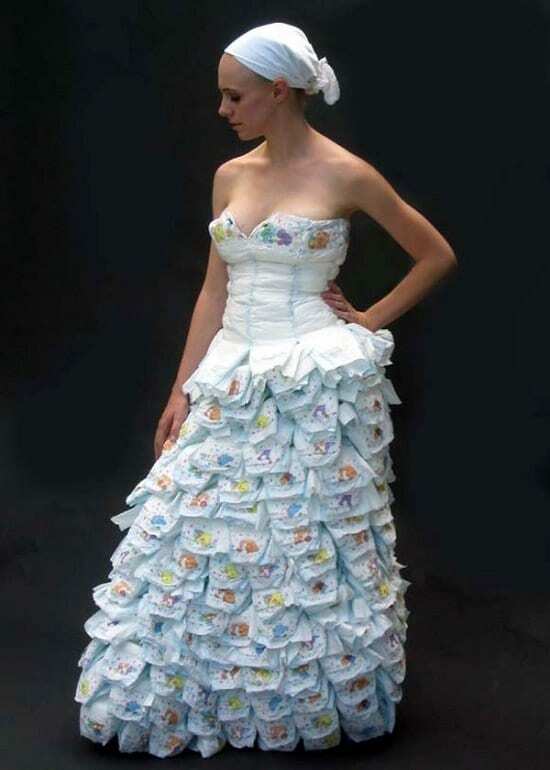 This wedding dress certainly is something, and were not sure which aspect is more in-your-face; the chiffon or the ruffles.